Polyester has become the dominant raw material in the American and global apparel market. The advent of polyester, the most popular man-made fabric (MMF), is a key turning point in how the apparel is designed and produced in the market. It has brought significant changes in how apparel products are made, priced, and distributed. Polyester was innovated by British scientists John Winfield and James Dickson in 1941. Later, in 1945, an American conglomerate, DuPont, bought the rights to mass produce the fabric in Delaware plant. Since then, polyester has gone on to dominate the fabric market and has overtaken all other clothing materials, including cotton. The above chart shows how rapidly Polyester overtook all other fibers as the fabric of choice in a relatively short period of time. It is expected to sell at almost twice the cotton volume by 2020 with a further widening of the production and increase the gap between the other two main fiber types, cotton and cellulosic. Why is Polyester gaining ground in the market? When it was discovered in 1941, polyester immediately became high in demand over what was the mainstay material of choice cotton, due to sudden and severe trade restrictions imposed during World War II. Cotton was hard to come by due to the trade embargo’s and the ongoing war. The trade restrictions, combined with the demand for apparel, particularly in the west, forced the apparel industry to find an alternative readily available fabric. Polyester fit the bill perfectly – and right in time. The end of the war, however, did not slow down the demand for polyester. Aside from availability, there were other reasons behind its increased demand and desirability in the apparel industry. One of the main reasons was the significant production difference between cotton and polyester. Cotton is subjected to natural forces and intense labor requirements. As a result, its availability and production costs fluctuate continuously. Polyester, on the other hand, is a byproduct of petroleum and is entirely man-made, which makes its production more predictable both in terms of availability and the cost. Below are price comparisons between cotton and polyester. (Based on fabric made in China, for an order of 5000 mts each quality) . A significant reason for the growth in the demand of polyester has come from the growing apparel manufacturing industry specifically in China but also in India and Southeast Asia. China accounts for 69 percent of all polyester fiber production globally, and if India and Southeast Asia are added to the equation, these three regions represent 86 percent of global polyester production. In 1980, polyester demand was only 5.2 million tons globally but by 2000, it had reached 19.2 million tons. In 2018, demand its demand was 51.1 million tons. 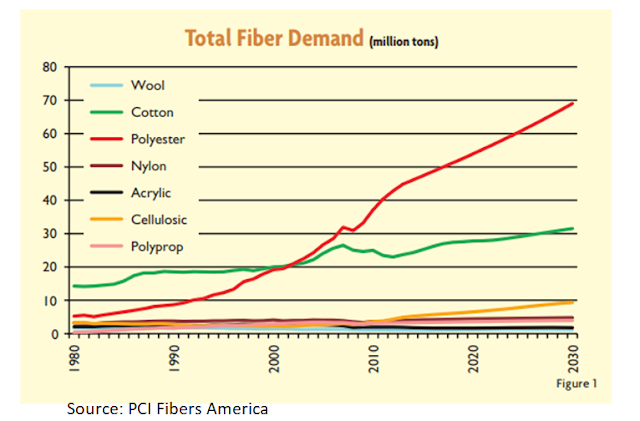 Looking at the period from 1980-2014, total fiber demand growth has been 55.7 million tons — 73.4 percent of which belongs to polyester. In terms of manufacturing demand, sportswear is a fast-growing segment in the apparel market. Not only do the big four in USA: The National Football League (NFL), National Basketball Association (NBA), Major League Baseball (MLB), and National Hockey League (NHL), continue to be popular with U.S. domestic and overseas fans but growing franchises like the National League of Soccer (NLS) are driving the burgeoning sportswear market. It should be noted that in addition to these professional leagues and their licensed products market, producers of active performance sportswear, like those manufacturing cycle, run and ski wear, use polyester as their primary and preferred material for fabrication. It is important to note that, one of the main reasons behind the high use of polyester in sportwear is due to the sublimation printing. It is the most popular printing technique used by many brands, designers and customers. Its less messy and easy to transfer. The look and the hand feel are much better than any other printing technique out in the market. The team sponsors, brands and customers prefer to have their logo’s, names on the jerseys and other items in vibrant colors with clear images. Sublimation printing does this well. Actual printing process is simple once the infrastructure in place. In most cases it is possible to do the actual printing on the finished garment, reducing the lead time significantly. Consumers in the United States are increasingly knowledgeable about the products they buy and want to know how the products they buy can make them safe and protect from the elements. Polyester based products come with various treatments which enhance the performance of the finished product. UPF 35- 50 helps to protect the wearer from the ultraviolet rays of the sun. quick dry, water repellent, cooling effects, anti-microbial, stain resistance and salt water resistance are some of the other added treatments can be found in polyester fabrics. While these different treatments help consumers varied ways, it helps retailers to market products too. As a manufacturer, it is important to understand market trends and offer products accordingly. Ensuring sales and marketing as well as design and merchandise teams are aware of the market trends and getting them to develop and offer new collections to buyers would help to secure more orders as those are more relevant to buyers need. Dr. Charm Rammandala is the Founder & CEO of IStrategy USA. Currently, he is the Head of Production and Global Sourcing at VOmax GDMC, LLC, which is one of the oldest sportswear companies in the USA. He has over two decades of experience in the fashion supply chain, where he has served in capacities such as Lean Manager and Model himself. He is an expert in rolling out programs in lean apparel manufacturing and sustainable labor costing. His former positions included being the first Lean Technologist at George Sourcing Services UK, Ltd. The origin of polyester. Reason of the rapid growth of polyester filament usage in the garment and fashion industry.